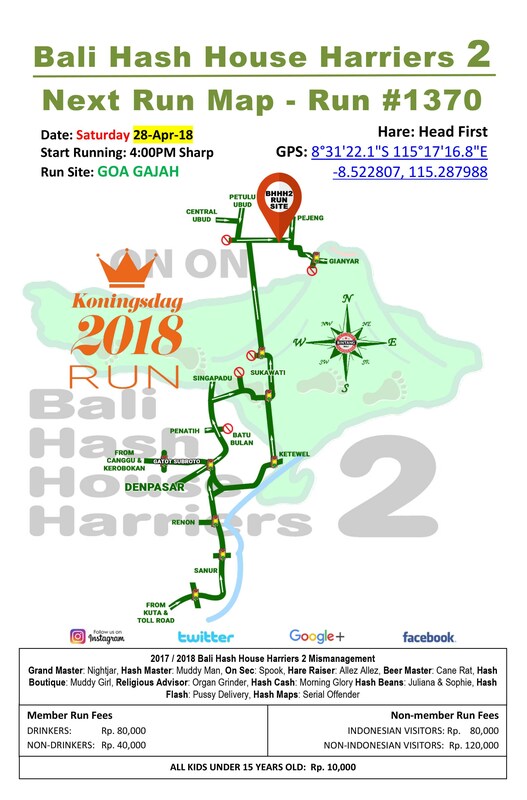 Join Bali Hash House Harriers 2 for the Koningsdag run this Saturday. Koningsdag or King’s Day is a national holiday in the Kingdom of the Netherlands. Celebrated on 27 April, the date marks the birth of King Willem-Alexander. Queen Beatrix abdicated on Koninginnedag 2013, and her son, Willem-Alexander, ascended the throne (the first king since the observance of the national holiday). As a result, the holiday became known as Koningsdag from 2014 on, and the celebration was shifted three days back to 27 April, the King’s birthday. In 2009, the Queen was celebrating Queen’s Day in the city of Apeldoorn when a man attempted to attack her by trying to ram the Royal family’s bus with his car; instead he drove into a crowd of people and crashed into a monument: seven people in the crowd were killed, as was the driver. Koningsdag is also known for its nationwide vrijmarkt (“free market”), at which the Dutch sell their used items. It is also an opportunity for “orange madness” or oranjegekte, a kind of frenzy named for the national colour. A drinking club with a running problem. Join Bali Hash House Harriers 2 every Saturday, Rain or Shine, for another great run in paradise.